Tuesday, April 21, 2015, I had the opportunity and supreme pleasure of touring in Petersburg, Virginia during their Historic Garden Week in Virginia. 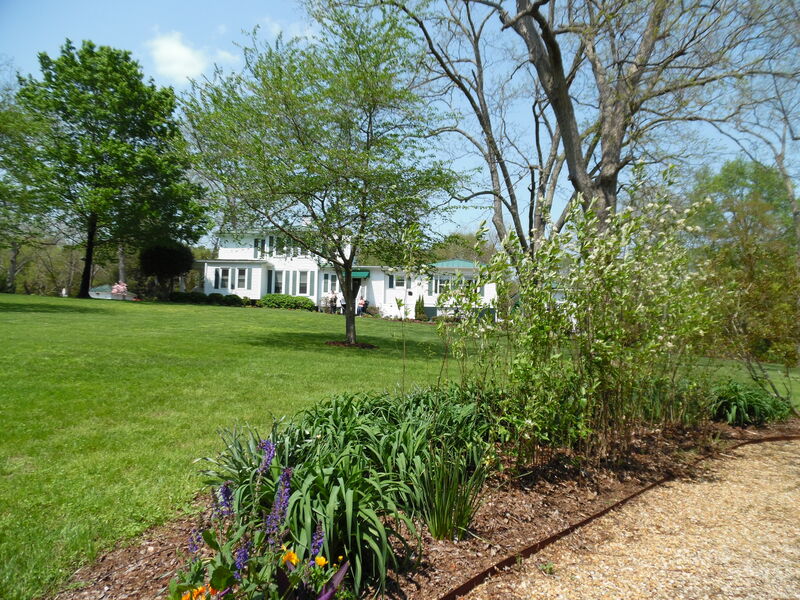 Can you imagine–all over the whole state of Virginia–my home state–during April, there is an open house allowing us to see inside over 250 of the most beautiful gardens, homes,and historic landmarks in the whole state! You can read about it in detail here: http://www.vagardenweek.org/ You can download a pdf of the Garden Club of Virginia’s Historic Garden Week ‘s guidebook with information, pictures, and directions to all of the sites at http://www.vagardenweek.org/assets/documents/hgw15-guidebook-complete.pdf It is full of amazing information and would be helpful in your planning for the tour the next two days, and next year! The fact that this is a volunteer effort is incredibly awesome to me! Hours and hours of hundreds of volunteers have gone in to this effort! We actually toured five sites plus a historic church yesterday, and everywhere we were warmly greeted by Master Gardeners, homeowners, historians and other volunteers! Today I am only writing this post about two of the gardens. I will blog about all the sites in time! My friend Sharon, a neighbor and cousin, took me and my wheelchair and we met my sister Anne and two of her friends, Gail and Sandra, from Richmond. The day was 77 degrees and sunny, glorious! We had a wonderful tour, and were all majorly inspired! One of the beautiful gardens we toured, surrounded a pond in front of the President’s home on the campus of Richard Bland College in Petersburg. While the home site is gorgeous, look at some of the pictures I took around the small pond just in front of this house! It is called an “Asian Water Feature” in the guidebook, I call it a secret garden, secret from the rest of the world! It looks like it’s modeled upon Monet’s painting of the Japanese Bridge and garden, just that beautiful! I felt a peace settle over me and an inspiration that was just wonderful! There were Master Gardeners everywhere, and they identified every single plant I asked about, but I could only do my best in trying to remember all the names! The second exquisite garden we toured was owned by Dr. and Mrs. Henry Tomlin–by God’s good fortune, we had the opportunity to be escorted and guided through the garden by Dr.Tomlin himself! You could never ask for a more gracious, knowledgeable guide! Afterall, he was the owner and landscaper himself! I suspect we had such good fortune because he wanted to save the rest of his garden from the accident prone, handicapped but enthusiastic garden tourist that was me! We entered on the path through a beautiful gateway and followed the path to the garden. Quickly we came to a grassy park area, surrounded by objets d’art in the lovely gardens which included dogwood trees in the distance and made you go “aaaaahhhh!” It looked like we could walk around the little grassy island, but soon after I ventured out in my power wheelchair, I realized it was wet–very wet! I sunk through the grass and couldn’t move backwards or forwards! My spinning wheels were making tracks, ruts and digging holes in his pristine grassy park! Ooooooh! I felt terrible! We had not met him yet, but my friend helped me out of the chair, and started trying to push the 500 lb. power chair out of the mud/grass! A very kind man came along to help, and it turned out to be Dr.Tomlin,MD, a retired obstetrician, owner, and landscape designer of these beautiful gardens! I offered to pay to have the area I had messed up fixed, and he put me at ease, not even sounding like he’d like to conk me over the head when I’d made such a mess on such an important day! He did say as well, to be gracious, and I imagine to protect his gardens, to let him guide us through the gardens because he knew where it was dry! As it turns out, they own five acres, and have landscaped three of them! We had an amazing tour. I wish I would have had a tape recorder, because perhaps my pictures can, but my memory won’t do him or his garden justice. He told us that when Hurricane Isabelle came through that area in 2003, they lost 120 trees! Getting them all removed was the beginning of this fabulous garden! Just look at this beauty, and I hope you enjoy it half as much as I did! Dr. and Mrs. Hank Tomlin’s lovely home near Petersburg, Virginia. My precious sister Anne, waves as she goes in to tour the unique home while Sharon and I elect to start in the gardens. This sumptuous grassy park welcomes us to the garden. Virginia is for lovers–in the garden. Categories: A - Z Blog Challenge by the 10 Minute Novelist, Gardening | Tags: Garden Tours, Petersburg, Virginia, Virginia Historic Garden Tours | Permalink. I’m not sure when my love of gardening hit. Was it watching my grandmother working in her garden which always seemed to be magically full of beautiful flowers? Was it winning an award for my “Silver Bells and Cockleshells” dish-garden at age 8? Maybe it seeped in as I helped carry Grandma’s 60 to 80 pots of flowers out into the warm air every spring, and back into her bedroom in our house every Fall! Her walk-in closet became a miniature green house every winter! 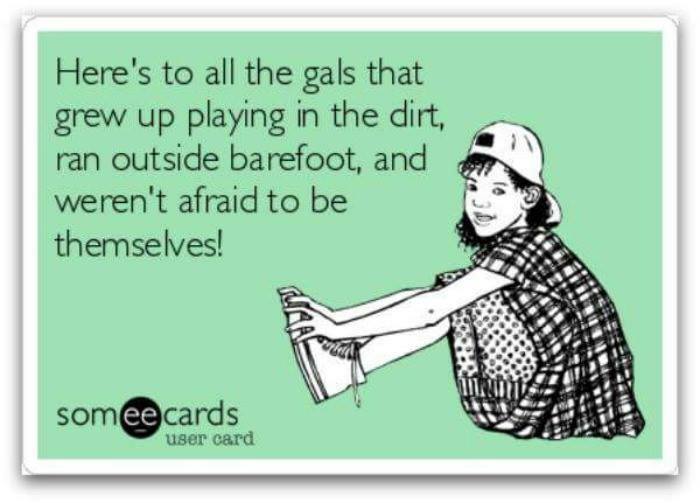 I remember playing in the sand box for hours with my brother and next door neighbor! That readily transferred over to the boxed garden where I was free to dig and plant! Little makes me happier these days than crawling around in my garden and digging in the dirt. About the only thing that tops that, is when my grandkids, now 7, 3, and 1 come over and get dirty with me as we dig, plant, and water amid peals of laughter, which drift through the neighborhood. I may have neglected to tell you, I use a power wheelchair when I go outside or away from home. It allows me the freedom to run around like I used to do before I got sick. I use mine at home like a four-wheeler, running all around the yard, pulling a wagon full of dirt, compost, flowers, and sometimes children! What a sight I must be. More than once, when a new neighbor moved onto the street, at some point they see me on the ground, the empty wheelchair sitting nearby, and come running over to help me get back up! They never dreamed I slid right out of that chair on purpose, and that I can climb right back in… albeit not very gracefully. But it is FUN! It improves my quality of life, and brings me joy, what could be better than that. The older woman who had recently moved into the neighborhood, was chatting with her neighbors outside as they went about their beloved gardening activities. They were weeding, transplanting, feeding, even picking pretty flowers to use in their home. Little did they know how envious she was that they were healthy enough to do what she could no longer do. Her two heart attacks had forced her to quit work and use a wheelchair. One neighbor, just her age, was president of the local garden club. The others were a husband and wife, ages 87 and 75 respectively. They were becoming friends quickly, so Julie felt comfortable just “hanging out” while they worked. Julie watched, wide-eyed, as Michael, who was 87, sat down on the ground and scooted or crawled over to where he wanted to go next. He thought she was thinking he was crazy lazy, so he explained that he had mild heart failure and a pace maker, and that leaning over to garden was too stressful for his heart. All the while, she was thinking “Wow! Wow, if this old man can do this, so can I!” She explained to the couple about her own heart troubles. She was so excited to think gardening might be in her world again! She decided to try it. She made sure she had her cell phone with her to call for help if she needed it–her husband was still at work teaching. Julie collected her trowel, gloves, and a basket, and parked her wheel chair near the end of a garden overrun with weeds. She slid right out of her chair like it was a child’s sliding board. Then she scooted/crawled right over to the edge of the flower bed. She began to dig and pull weeds out, placing them in the basket. Before she knew it, she had crawled to the other end of the garden, about fifteen feet away, and had been working for an hour. The basket was filled long ago, and all along the path, stood piles of discarded weeds! She was tired, but oh so happy! It had been so long since she’d had the chance to dig in the dirt! It was better than therapy! (She had been a psychotherapist in her past life as a working professional.) However, now her chair was way down at the other end of the garden, and she was just too tired to crawl that far! Besides, she was filthy, what a sight she must make for her neighbors. Just as that thought occurred to her, Julie looked up and there was Paul from down the street. “Hi there, Julie isn’t it? Are you okay? I saw your empty chair, and I was afraid you’d fallen! What can I do to help?” He seemed very surprised to learn that she’d left her chair on purpose! But when she asked if he might be willing to drive the chair over closer to her, well– he seemed happy to try it out! “Cool, it’s kind of like driving a little car or something.” She encouraged him to take it for a spin around the yard, and he did! Soon they were chatting like old friends. She didn’t even mind that he watched her pull herself up, none too gracefully, into her chair, where she landed with a thump! They were friends now, she felt his support and care, felt no judgement or pity–just friendship. What a wonderful day– her heart sang, and happiness bubbled up from her soul! Do I dare ask what you think? 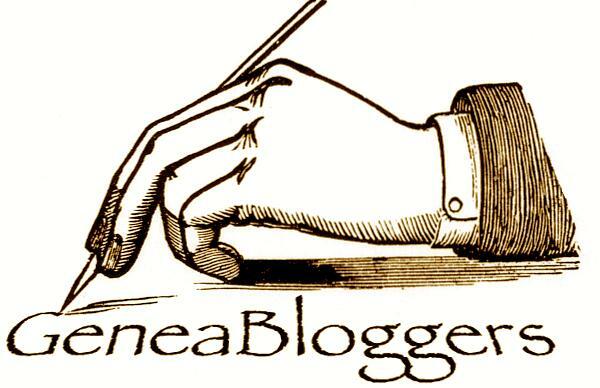 Will I ever make a fiction writer? I’m not sure I know how not to “tell” the story, but to let the story unfold, or be “in” the story. Hints? Suggestions–short of hang it up or go back to school? LOL We’ll see, maybe I was meant to be a non-fiction writer. Categories: Gardening | Tags: Fiction Writing, Gardening, Wheelchair Gardening | Permalink. Categories: Gardening, zero to hero challenge | Tags: Dreaming of Spring and summer, Flowers, Zero to Hero Challenge | Permalink. This is my beautiful Lady Banks Rose in all its glory, climbing all over this trellis after only 3 or 4 years! I actually started this rose from a cutting, well, several cuttings from a friend of mine in New Bern, NC. 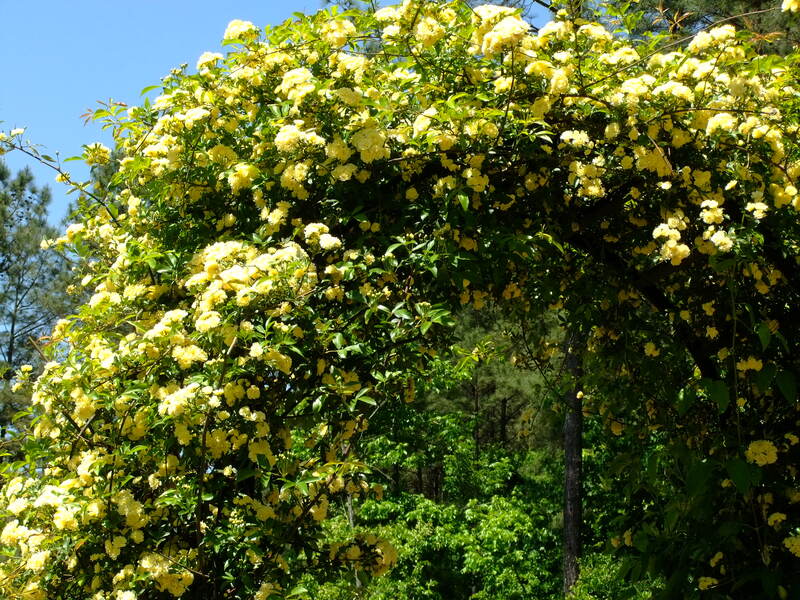 The Lady Banks rose, rosa banksiae Lutea, has clusters of double pastel yellow flowers in early spring. A climber, without thorns, Lady Banks Rose is easy to prune and train or it can be allowed to wander freely over shrubs or trees. It is also very disease resistant. The only problem I have with it is that it only blooms for about two weeks, and only once a year! I wish it lasted longer, even that it bloomed all summer! But then I probably wouldn’t cherish it so! It is its fleeting beauty that makes it so special! Perhaps. I’d like to believe I’d love this rose even if it bloomed 12 months a year! In the picture just above, you can see the pink, Asao clematis I planted to mix with the Lady Banks Rose! I just love the combination and find it helps call attention to the rose and the clematis! On the other side of this trellis grows a white, Snow Queen clematis. I just love the large, showy flowers of clematis, and I believe I have five clematis vines in my yard. They grow quite vigorously, with little attention if you plant them so that the roots and first sprouts are shaded by other plants, otherwise they just don’t thrive! 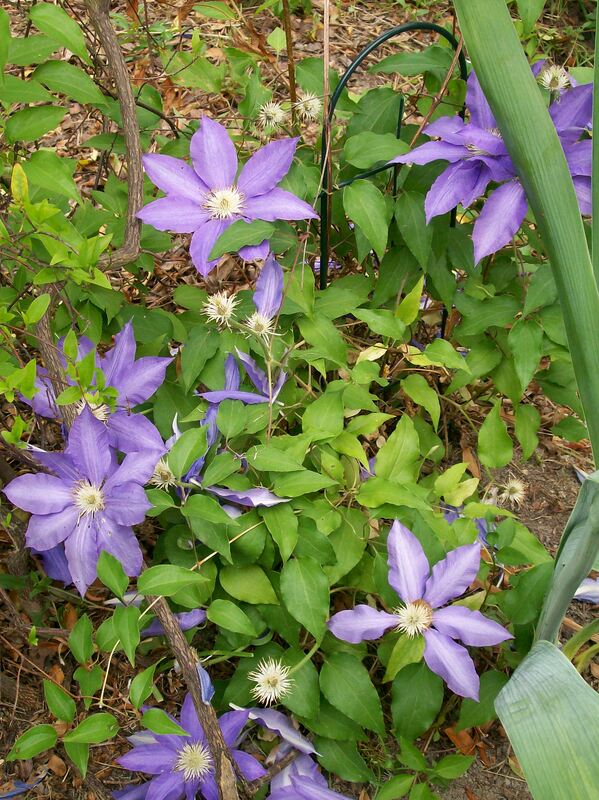 Pruning clematis is one of the trickiest things about them, but you do not need to prune them at all, If you do feel the need to cut them back, I advise you to read up on the particular kind that you have, because they all fit in three major categories of clematis, and all three categories have specific pruning instructions. 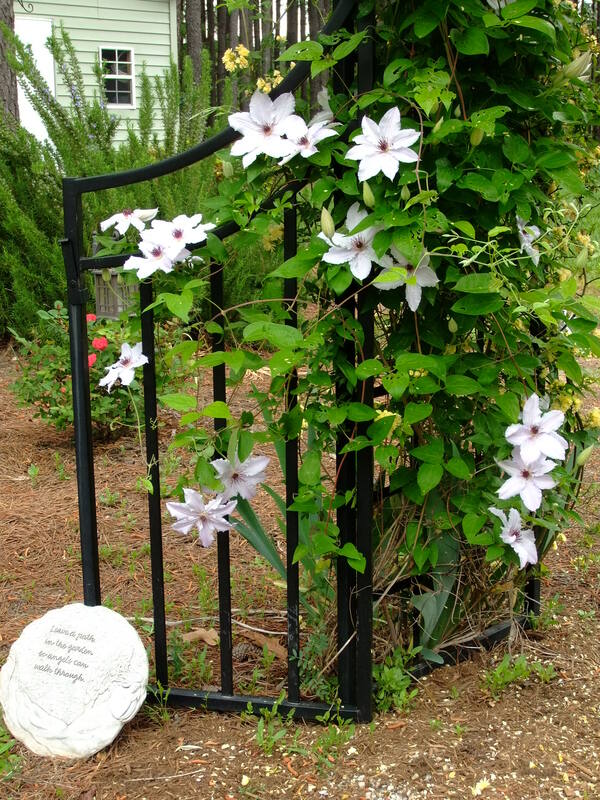 My favorite website for information on clematis, is the newsletter put out by Brushwood Nurseries at http://www.gardenvines.com. You can shop for clematis there also, and I love their expertise. Below you can see the Snow Queen clematis blooming. On the other side of my yard, on a different trellis,and pictured above is a clematis called amethyst beauty. Isn’t it lovely! It is climbing among the Carolina Jasmine. 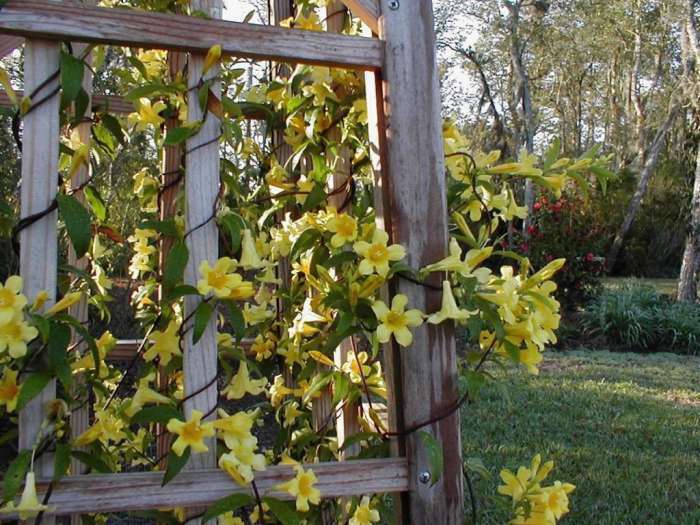 Carolina Jasmine is a small yellow flower with a lovely sweet fragrance that blooms in the late winter/early spring! It is evergreen and covers a trellis quickly, I just love it! We have it on a trellis just outside of our screened porch, so that we can smell it as soon as we exit the house! I have many more vines, because I just love them! But they bloom in the summer or even in the Fall and I will share them with you as we go along. If you have questions, please leave them in a comment and I will do my best to answer with the best research I can do. 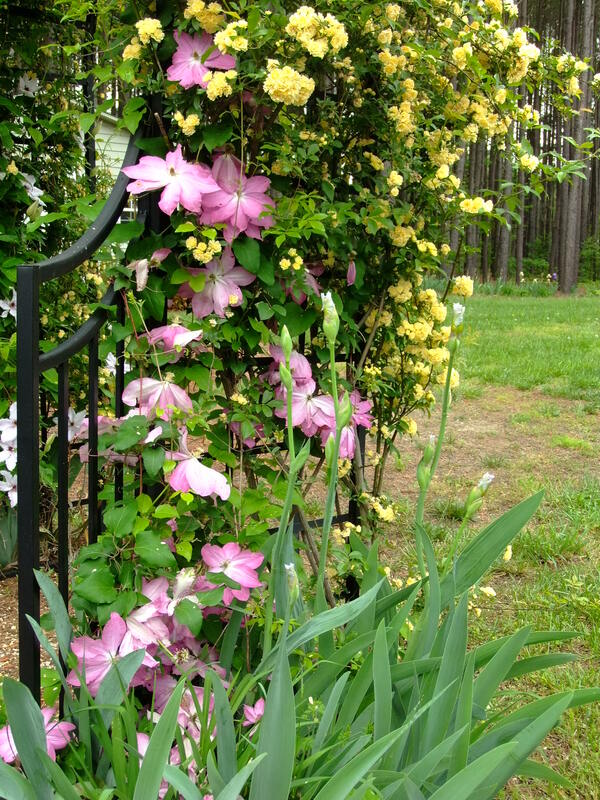 Categories: Gardening | Tags: clematis, Climbing, Garden, Lady Banks Rose, Vines | Permalink. The Irises have taken my breath away this last four weeks! What joy they bring, what a reason to get up and go outside in the morning! I don’t see how anyone can doubt the existence of God while gazing at the intricacies of a flower! 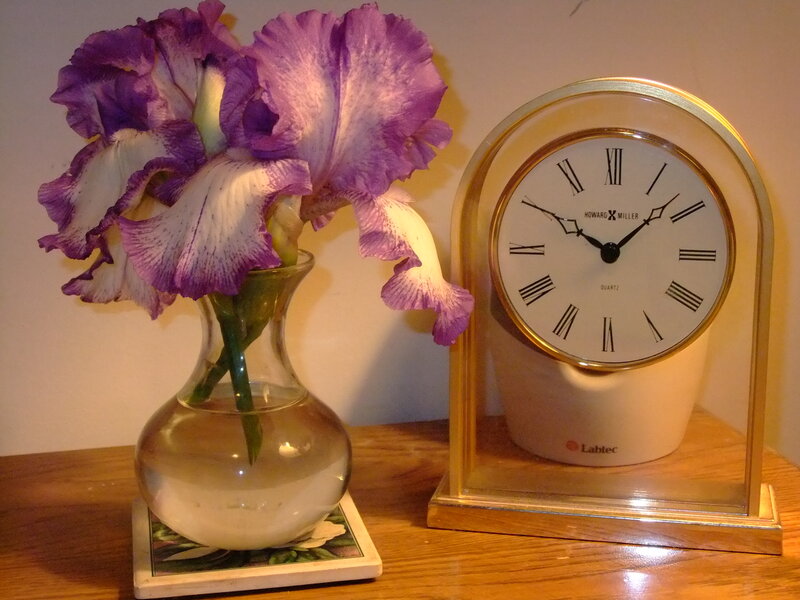 Today I am showing you bearded iris, although there are several other kinds and I have some that perhaps we’ll be able to share another time. 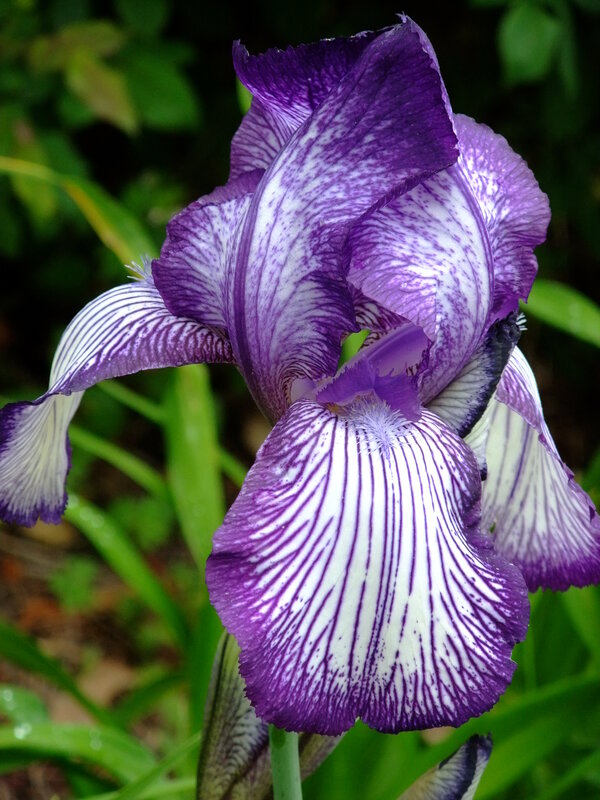 Again, I am no expert, but I have learned a few things in my 64 years and I’ll gladly share some of the things I know are good for Iris and that I hope will help you have beautiful ones ! I’m dying to show you some of the beauties in my garden, and would love to hear about yours! From bud to blossom they simple amaze me! I love the colors of the rainbow! 1. They need full sun, at least six hours a day or they will not bloom well. 2. They need to be planted very shallowly. The rhizome, or tuber, needs to be seen above the dirt, with the roots reaching out underneath! The rhizome needs to be able to soak up the sun to produce food. If you cover your rhizomes for a severely cold winter or severely hot summer, be sure the rhizome is uncovered as early as possible in the spring. 3. 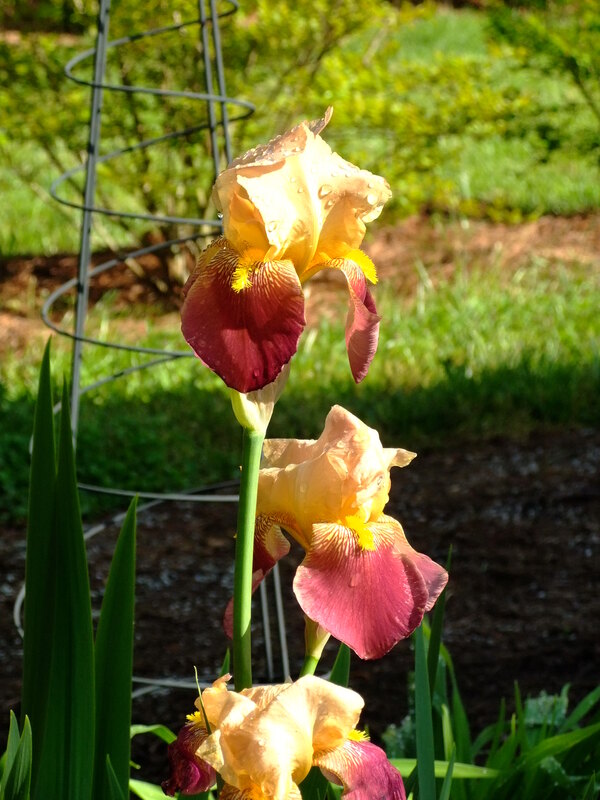 Along with number 2, Irises cannot stand to sit in water, they rot and die. Therefore they must be planted in soil which drains well, even if you have to put them in a container or raised bed. If you have clay soil which holds moisture so badly, be sure you condition your soil with gypsum or something to make it more porous. 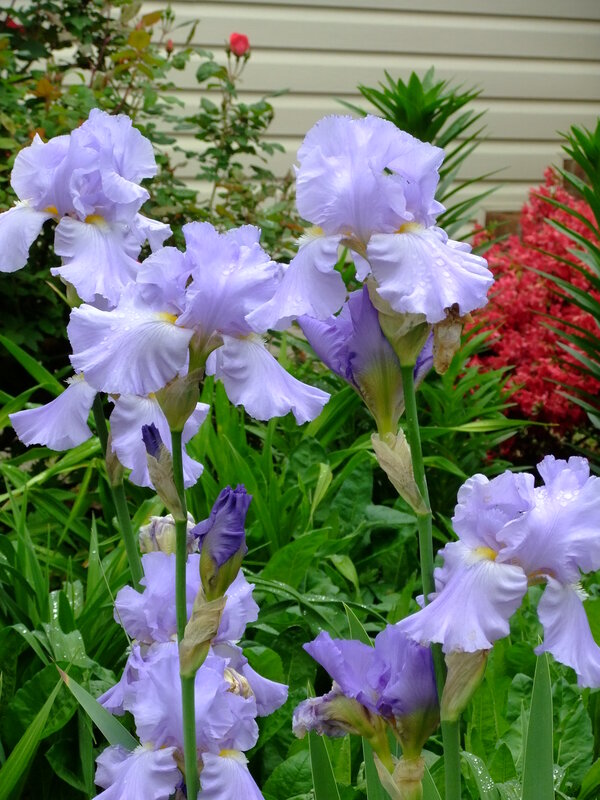 Before planting your Iris it helps to till the bed 10″- 12″ to facilitate drainage. 5. 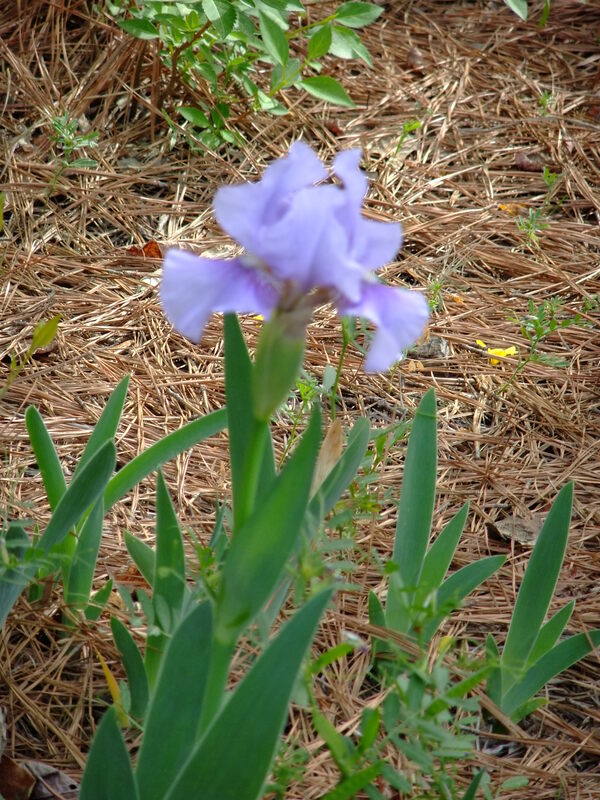 Iris respond well to low nitrogen fertilizers. Super phosphate works very well and is what I use. My sister, an excellent gardener taught me to use lime when necessary in late Fall like November as it takes a while to work its way into the soil. 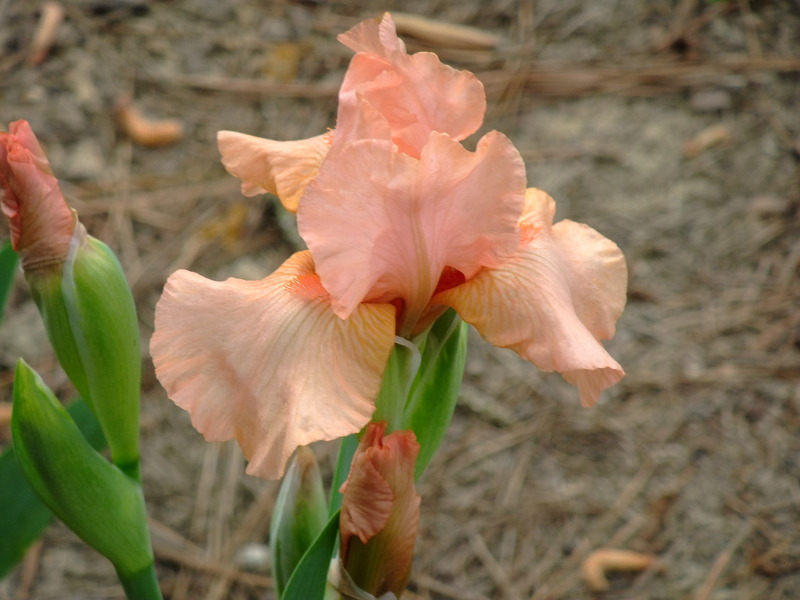 She then said work the super phosphate into the soil around the Irises in the month of November and February for April bloom. I have also read it helps to feed the rhizomes one month after the blooms finish as well. 6. One other thing I want to point out. Iris need to be divided about every 3 to 5 years. If you do not, the rhizomes will multiply and get so crowded that they may not bloom, or the blooms will certainly diminish. 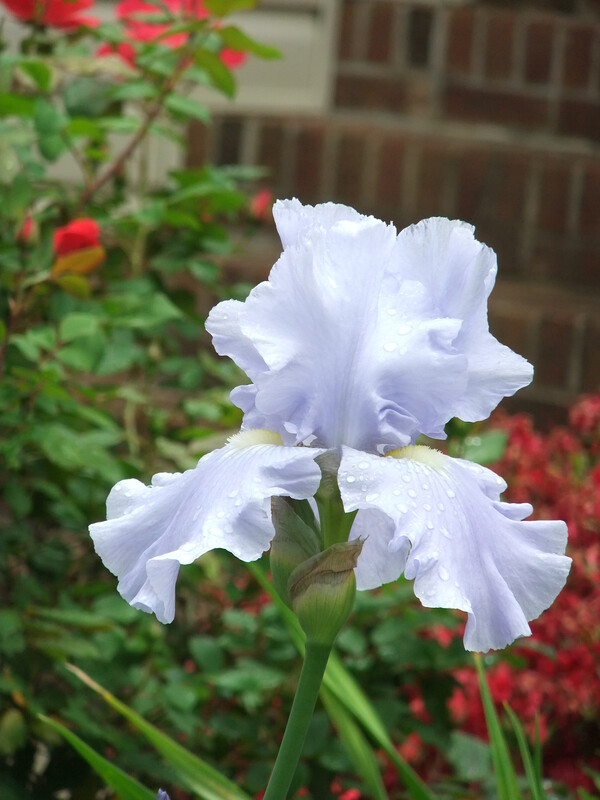 Iris should be divided in July or August, but if the heat is too severe, the task can wait for September. Dig the whole clump up, gently pry the rhizomes apart, I have had to cut them, and replant as suggested in the first guideline above. 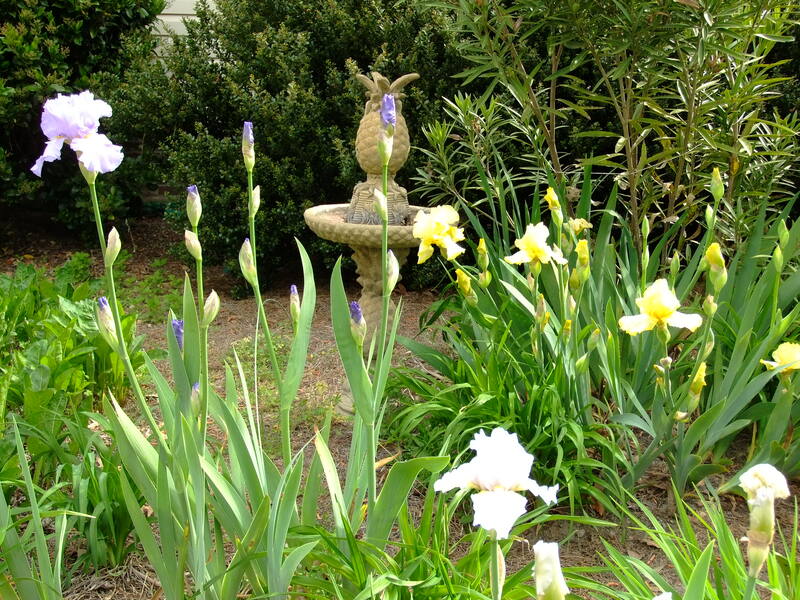 Categories: Gardening | Tags: Home Gardening, Irises, Perennials, Plant, Rhizome | Permalink. On March 16, I showed you what was blooming in my garden in March, on my birthday, and I promised a follow-up. Here it is! 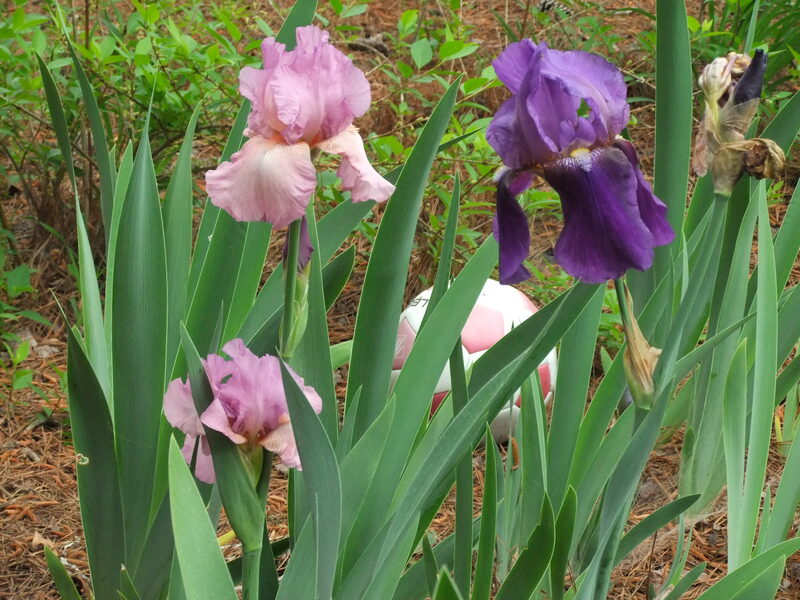 In March we had the spring blooming bulbs like daffodils and hyacinths, bulbs that you need to plant in the Fall. Remember I said let the foliage stay on the plants to soak up the sun and manufacture food for the bulb. By now those green stalks are probably turning yellow and falling over. This is a good time to go ahead and trim the green leaves back to about an inch above the ground and let them go completely dormant until next Spring. Remember the forsythia, just coming into bloom, but mostly brown and woody looking? Look at it in all its glory! I just love the brilliant, sunshiny yellow of forsythia, it just makes me smile! In this picture where you see the forsythia, you also see the new trellis my husband Max is building. I will tell you more about it in a future post. 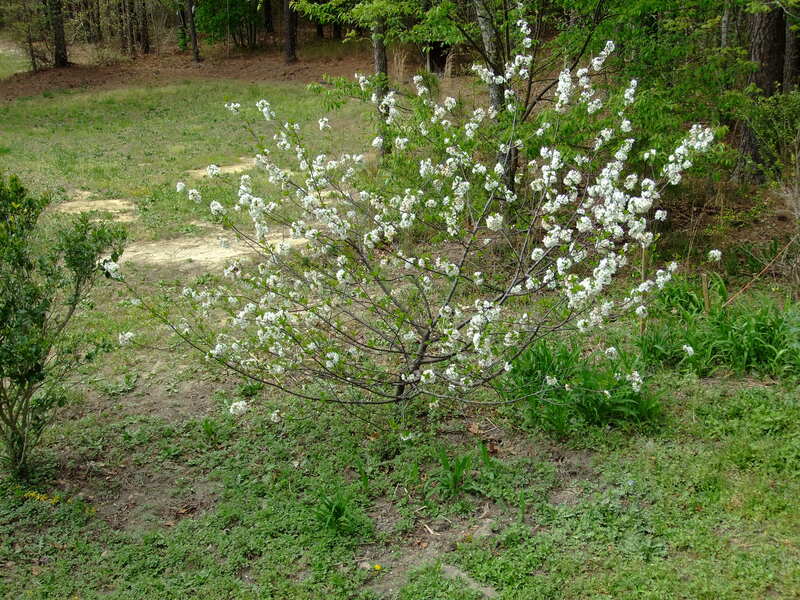 By April; 15, 2013, our dwarf cherry tree was in full bloom! I grew up going to the Cherry Blossom Festival in Washington D.C., so when the cherry trees blossom now, I still feel a sense of celebration and good fortune! I love the fluffy blooms, which give way to green cherries by May 4, and will soon be red and ripe! These cherries are absolutely fantastic in pies! We have plenty so we share them with friends and the birds. We have three cherry trees on our little half-acre which is half woods! This abundance of pink/fuchsia loveliness below is like fire lighting up the landscape when it blooms in late March, early April! 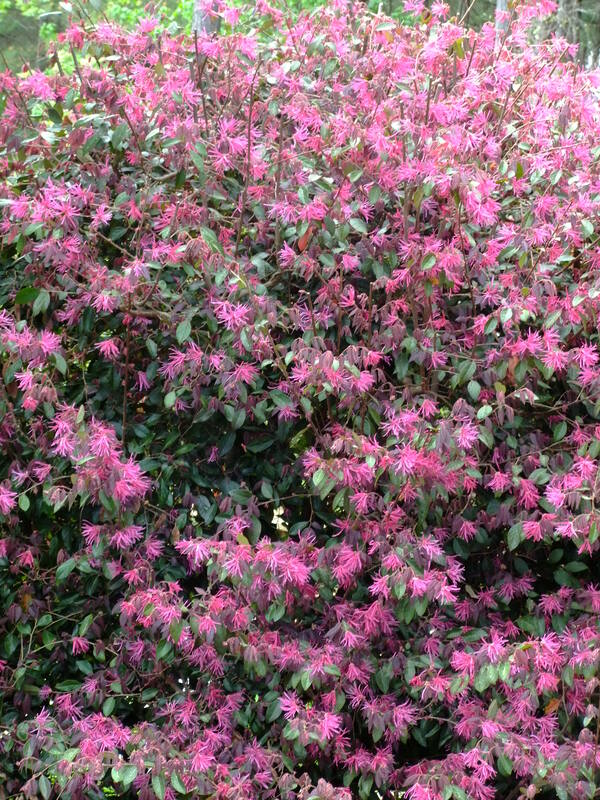 It is a loropetalum, a shrub that can grow 10 to 12 feet tall! Before we planted this shrub about 5 years ago, I had no experience with it. A friend actually gave it to us. We planted it on the eastern corner of our house where it gets the sun from early morning to about 2 in the afternoon then is shaded from the harshest afternoon light. Obviously it thrives there. There is also a downspout there, so it gets lots of moisture as well. I never have fed it or done anything but prune it occasionally keep it somewhat in bounds. It is not necessary to prune it at all, but if you do, I’ve read that you should do so right after it blooms. By summer it will be setting its blooms for next year, so you wold ruin all your color if you cut it back after that. This pruning business is one of the trickiest parts of gardening in my book! But I love to read gardening books, so getting the information is not hard, especially today when we can just “google it”! LOL One more treat to the loropetalum is that our shrub has babies! We gave five to a neighbor last year and they are 2 feet high and precious right now, making a wonderful natural hedge for her property. I love having things in the garden I can give away. By April 15, the snowballs are adorning their bush, officially called a viburnum. They start out green and refreshing looking, and slowly over about 2 weeks turn white and fragile looking! They bloom for a good 4 weeks , if not more. As you can see by the pictures below, you can have shrubs that sport huge snowballs or small ones, I love them both! The huge snowballs below are on my next door neighbor Dora’s shrubs, aren’t they incredible! When I was a child in Richmond,Virginia, my paternal grandmother lived with us. She was an excellent gardener! In the Spring she could always be heard telling us children, “When the snowballs fall off the bush, then you can go outside barefooted, not before!” Since they didn’t fall until mid to late May, that was a pretty good bet that the weather would be warm enough! One thing she might not have bargained for however, was all the eager little hands out there shaking those bushes trying to get the snowballs to fall! She could tell if we cut or picked them! Then, woe was us! Remember to cut and take blooms inside to enjoy as well. Especially if heavy rain storms are predicted, or a late freeze, you never know what will be left in the morning, I love to enjoy them at my desk! 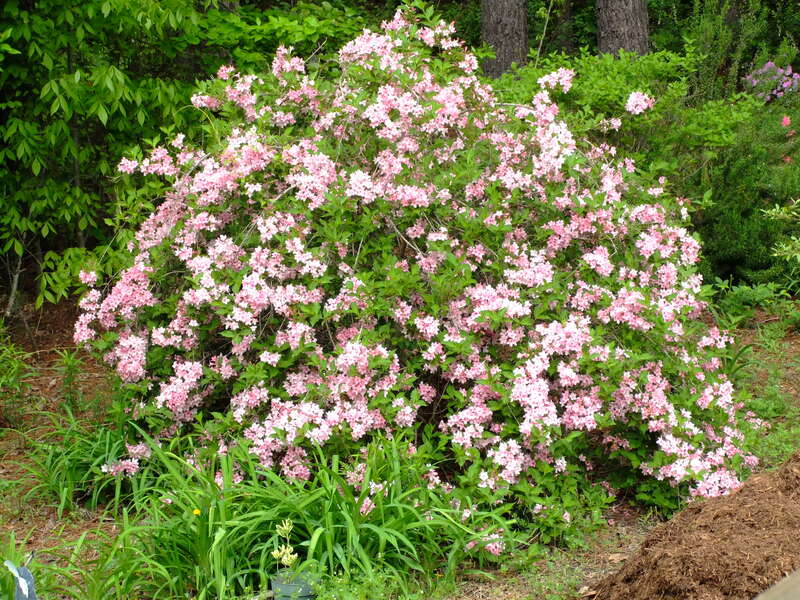 What more well-known, and well-loved spring-flowering shrub could there be than azaleas! So many colors, and so many sizes! Now they even have reblooming azaleas so we can enjoy their beauty several times a year! How can you frown when you see such vibrancy in your garden! Just a few tips I’ve learned along the way: azaleas can’t stand wet feet and they like to be planted shallowly and on a mound or rise so that water drains away well. Of course you know, I’m sure, that they like acid soil conditions so pine tags make the perfect mulch for them. 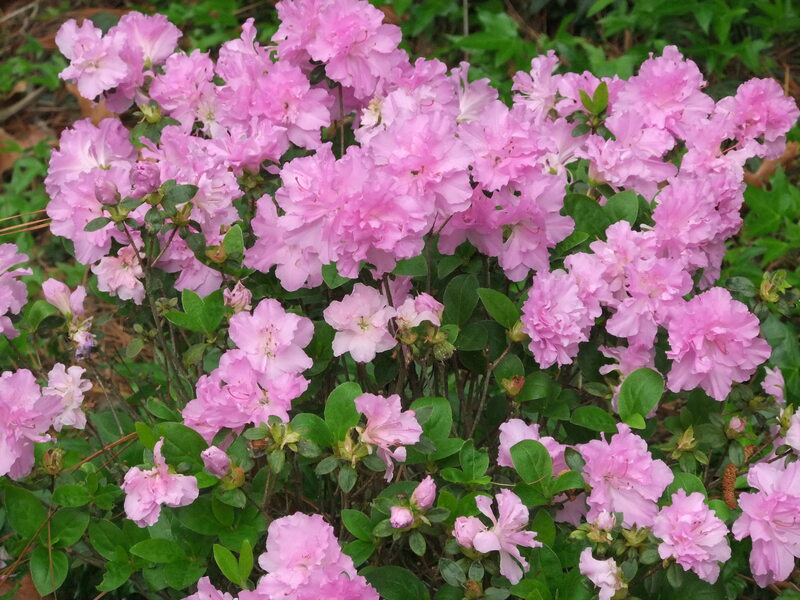 It used to be that azaleas needed to be planted in shade or only filtered light, but nowadays they make sun azaleas as well, be sure you check your tag for all the statuses like reblooming, sun or shade, and any other blooming requirements. 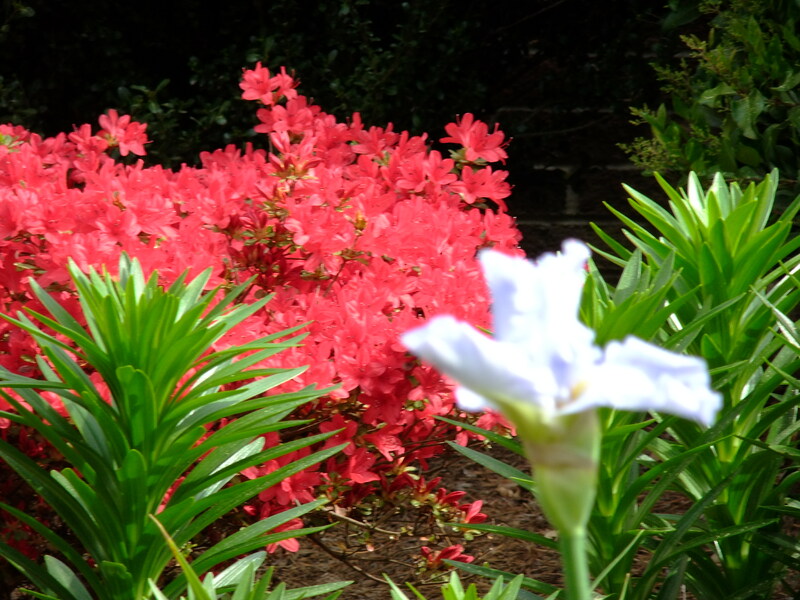 The first azalea shown below is a “wolfpack red” azalea. That sells particularly well in this area of North Carolina, because the Wolfpack is the name of the sports teams at North Carolina State University in Raleigh, NC. The pink azalea below left, is called “mother’s day” but usually blooms before that date by a week or so. The purple is one of my favorites, and is a reblooming azalea so treats us again in the Fall! 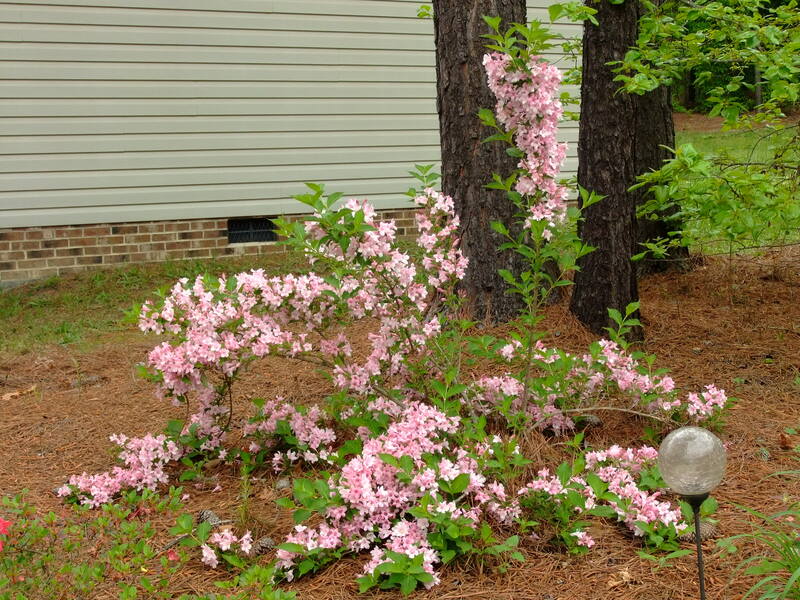 Below is pictured a large pink Weigela and a small one that I started by layering the larger shrub. Layering is a simple propagation technique which works well for many flowering shrubs including camelias, forsythia, azaleas, gardenias, and many more. 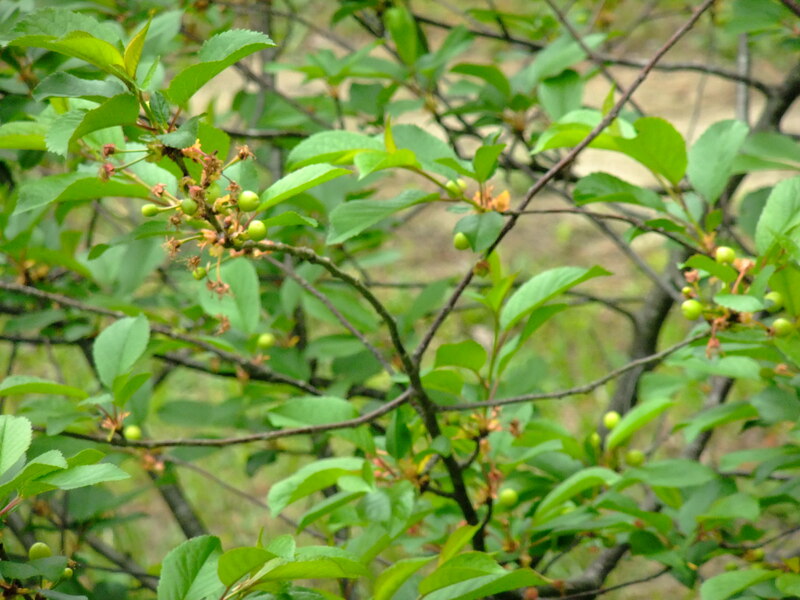 You take a lower branch, scrape some of the bark off of the middle of a branch, then leaving the branch attached to the mother plant for food, bury the scraped part in the dirt below the plant, with the end of the branch sticking up above the dirt. In about eight weeks you should have a whole new plant that you can sever from the mother plant and move wherever you’d like a new shrub. This is a great way to increase your favorite plantings! There are several more shrubs I’d like to show you , but they will have to wait for another post. 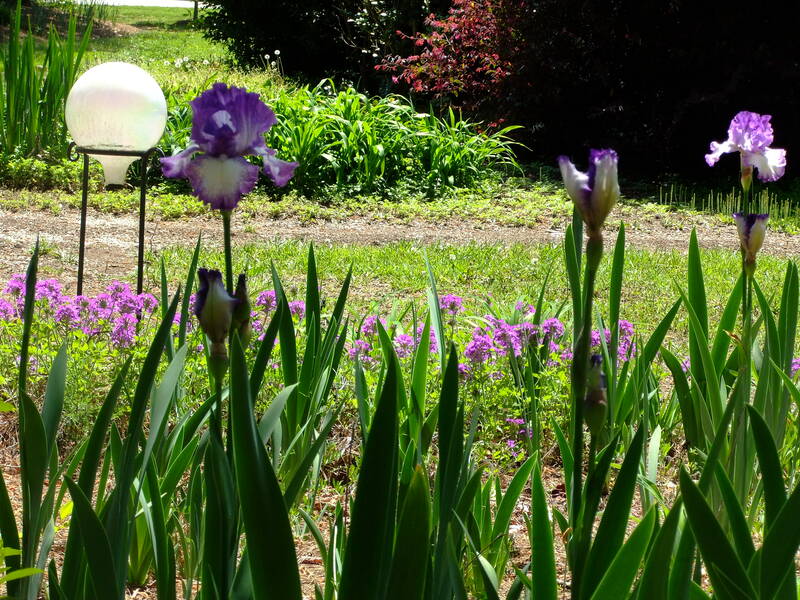 I can hardly wait to share my Iris with you, the joy of my spring gardening, along with the Lady Banks roses and clematis! Bet ya just can’t tell how much I love my flowers! LOL I’d love to hear about your favorite flowers as well. 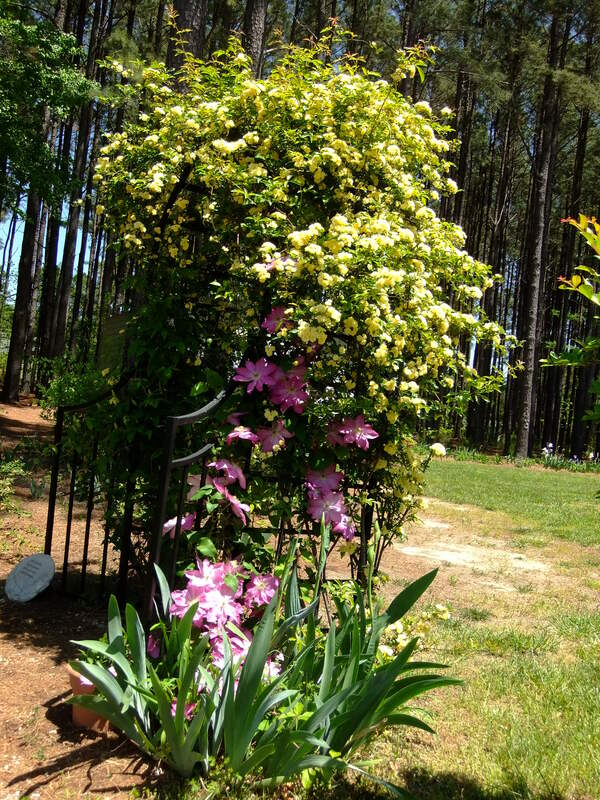 Categories: Gardening | Tags: anowballs, azalea, forsythia, Garden, loropetalum, Shrub, weigeila | Permalink. Spring is almost here! You can feel it in the air! I’ve actually been out digging in the dirt a couple of times now! I can hardly wait to have a year full of flowers! Yesterday was my birthday and I enjoyed rolling around my yard in my wheelchair, taking pictures of the few things already in bloom! I could hardly wait to share them with you! Look at this beautiful plum tree just blooming its little heart out! My college roommate, and close friend for over 40 years now, Carol gave this tree to me for my birthday two or three years ago–its still young, but so beautiful! Of course, who doesn’t love the look and smell of the spring blooming bulbs pushing up through the soil to cheer up our dreary landscapes! Even though I’ve planted about 75 daffodils along a bank bordering my front yard, I only have about ten to fifteen actually bloom in any one spring! I remember my grandmother who lived with us, had a huge garden of daffodils, so that we would have hundreds of flowers blooming in the spring! We were free to take bouquets to teachers and friends, which the little girl in me loved to do! Those memories, and the fact that daffodils always bloom around my birthday, make them one of my favorite flowers! On the left below, you’ll see a hedge of what looks like dead, brown branches. But in reality, its one of my favorite flowering shrubs, just beginning to awaken from its long winter sleep. If you look closely you’ll see a few little yellow flowers peeking out. In another couple weeks, these branches will be covered with yellow blooms! They make a spectacular sight, as blinding as sunshine bursting forth on a winter’s day! Can you smell these wild violets? They are one “weed” that I cultivate in my garden, because I love the smell and look of these dainty little purple flowers! Right at the edge of the woods part of our yard, we’ve planted some Bridal’s Wreath! It’s also just beginning to show its beautiful colors! these branches will be covered with the white flowers in another week! I’ll try to remember to show them to you. Are you familiar with vinca? There is vinca major and vinca minor, and vinca variegata, all of which I have, and there are more variations I am sure. Periwinkle is the common name for this evergreen vinca vine, not to be confused with the vinca flower which I love to grow in the summertime! I love the fact that it is evergreen, and that it runs along the ground and makes a lovely ground cover. It can run everywhere however, so choose wisely where you want to plant it. Mine thrives in shade and sun, and wet and dry conditions here in North Carolina. I’ve even used mine to cover a tree stump that I chose not to have removed. It looks quite lovely! I gave my next door neighbor some, and she has it shaped in a perfect circle around her mailbox! I am especially touched when I see my vinca blooming, as it was something I brought from home, my childhood home in Richmond, Virginia. So at 64, these plants have been with me all my life! They have beautiful little violet blue flowers im the Spring, and I just love them. Here’s one more little thing poking its head up through the pine tags! Its my verbena, purple homestead, just beginning to bloom! This is another great groundcover, that begins here in March, and will grow and bloom prolifically all summer long and into the Fall! How delightful that the flowers are beginning to bloom! I’d love to see pictures of your own if you can post them along with your comment, I don’t know if that’s possible, some of you more tech savvy folks will have to let me know! Wishing you all blooming flowers and joy inyour own life! 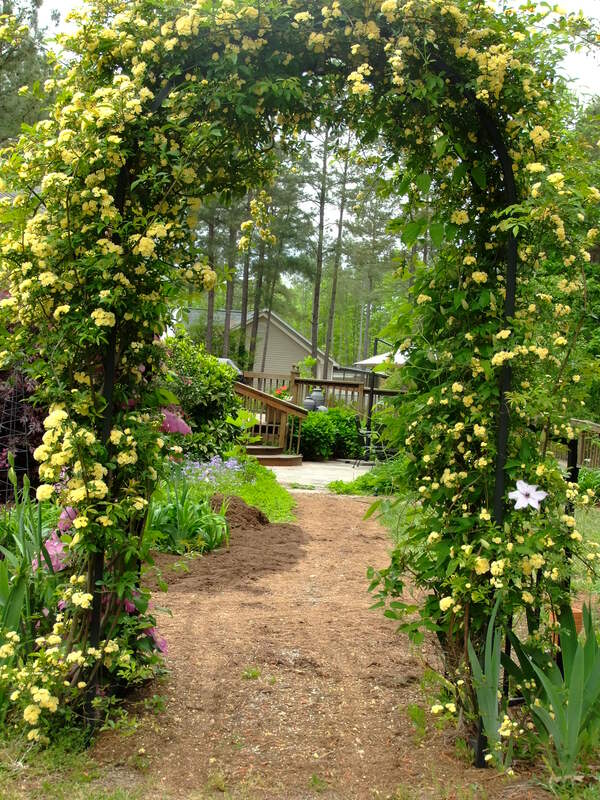 Categories: Gardening | Tags: Blooming in March in Raleigh, bridal wreath, forsythia, Gardening, NC, plum tree, verbena, vinca vine | Permalink.